Sledgers & Sandbaggers: Shock, Horror; Pietersen in the right! The MCC have determined to look into the ramifications of the reverse slog-sweep shot unveiled by Kevin Pietersen at Chester le Street in the first ODI against New Zealand on Sunday. The reasoning behind the decision escapes me. Surely the idea that cricket’s governing body can dictate to batsmen what shots they can and cannot play is by any standard ludicrous. What next, the cover drive coming under scrutiny? There are more pressing matters that cricket administrators could spend their time discussing. The arguments mooted in favour of taking action against the stroke are spurious at best. Claims that umpires won’t know whether to adjudge LBW decisions based on whether the batsman is right or left-handed don’t make any sense. Kevin Pietersen is a right handed batsman; if he attempts a switch shot he is still a right handed batsman and decisions must be made accordingly. Otherwise the situation would be farcical. A batsman could make a mockery of the game by turning every ball into a wide by adjusting his stance accordingly at the opportune moment. If the powers that be still have a problem with the technical legislation then Daniel Vettori’s suggestion that bowlers should be able to bowl within the wide lines on either side of the wicket in such situations is a fine compromise. One can’t help but feel that this is a storm in a teacup. If the Pietersen shot is such a problem then how has cricket survived controversy-free for the past 15 years, during which time the reverse-sweep has entered the game as a legitimate one-day shot? No one tried to stop Andy Flower from playing that particular stroke, and I am at a loss as to how this is any different. Critics argue that the current situation is not the same because Pietersen changed his grip before the ball had been delivered, but this is simply nitpicking. 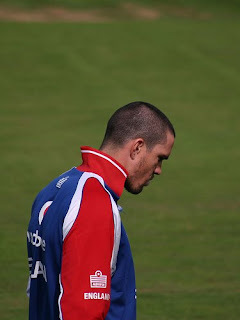 Both the conventional reverse sweep and Pietersen’s extreme version are examples of pure pre-meditation. The precise timing of the perspective shift is irrelevant as the decision has been made in advance of the bowler releasing the ball in each case. Surely once a batsman takes his stance and the bowler is running in he must be considered to be a left or right-hander accordingly. Whatever he does subsequent to that is his own business. Mike Selvey argued in the Guardian that as the bowler must notify the opposition before he changes his action, the same regulation should apply in the inverse situation. Cricket however is not and never has been an equal opportunities sport. Batsmen have always had more freedom than bowlers. If we extend Selvey’s argument, the batsman shouldn’t be able to advance down the pitch beyond a certain point without being censured. Hayden and his ilk have made a habit of bullying bowlers around the world by walking down the pitch at them wee before the release of the ball. Nobody has questioned the legality of that particular tactic. One of the challenges of being a bowler is being able to adapt to what the batsman is doing in his crease. Pietersen is doing nothing that hasn’t been experimented with one way or another in one-day cricket throughout its history. But we are getting caught up in side issues here. The number of players in world cricket able to hit this shot with any degree of success or consistency whatsoever is minuscule. The combination of strength and co-ordination required to execute it means it’s simply not an option for the average cricketer. The shot is not going to change the face of cricket for this very reason. Why should an athlete be punished for having a skill virtually unique to himself? Surely the sport should celebrate rather than discourage its exceptional talents. Whatever one thinks of Pietersen, he is most certainly that. Have just seen your comment on my cricket blogsite, thanks for your request for a link exchange and as I have seen that you have already added my site I will be doing yours right away :) Feel free to check my blogroll within the next 10 mins and you will see yours on there, I see your site as highly original in its content and sledging is something in cricket that is commonly discussed in the sport and no doubt there is alot of people that enjoy reading your content. Nice post fella. KP should keep doing it because he can. You can't change the rules just because everyone else is worse than he is! And besides that, it's taken the MCC four years, and counting, to come up with a common ground on bat size and weights, so I doubt it'll be an issue anytime soon! CDAK, I've added a link to your site on my blog roll, keep up the good work! Cdak: with you on this one mostly. I think the wide situation needs to be clarified. I've got more to say; let me organize my thoughts a bit. PS: Thanks for the link; will reciprocate. Kp is a huge talent and to criticise him for that would be ludicrous - it's an amazing shot and one that should be kept in the game. I agree that Pietersen's shot should not be banned. But they should also do away with bowlers having to state what they are bowling. The bowler should be allowed to bowl with either hand if they want to.